Histological techniques 3. Embedding. Paraffin. Atlas of plant and animal histology. To observe tissues at light microscopy, paraffin is the most widely used embedding compound. The paraffine embedding procedure of fixed samples is described below. Paraffin is a wax-like substance composed of a mix of saturated hydrocarbons. It is solid at room temperature. The melting point is between 40 and 70 ºC, depending on the composition of hydrocarbons mix. Thus, harder paraffin at room temperature melts at higher temperatures, whereas soft paraffin melts at lower temperatures. Tough samples are recommended to be embedded in hard paraffin. Most used paraffin have a melting point close to 60 ºC. Some substances can be added for modifying hardness, viscosity and fragility of paraffin. Paraffin is not miscible with water, but tissues are mostly water. In addition, most fixatives are aqueous solutions. This means that water must be removed from tissues before they are infiltrated with paraffin. It is done by dehydration of tissues with alcohol, mostly ethanol, from a graded series of alcohols from 50º to 100º (absolute o pure alcohol). All the water needs to be removed for a good embedding. After dehydration, samples are transferred to an intermediary liquid, like xylene, benzene, propylene oxide, or toluene, which are miscible with both absolute alcohol and paraffin. These are clearing substances and we can check their infiltration in the sample by observing how translucent the sample is. The immersion of the sample in the intermediary liquid, like xylene and toluene, must not last very long because they harden the samples and getting sections might be more difficult. The last step of the embedding procedure is to plunge the sample in melted paraffin. It is done in an oven at a temperature properly set for the paraffin type we are working with. For a complete replacement of the intermediary liquid with paraffin, three changes in fresh paraffin are recommended. How long the samples are incubated in paraffin depends on the intermediary liquid, size of the sample, and type of paraffin. For example, it should be longer for large samples. However, if the immersion last very long, paraffin may harden the sample. On the other hand, short paraffin incubation times may render poor paraffin infiltration, which can be worse than long incubation times. 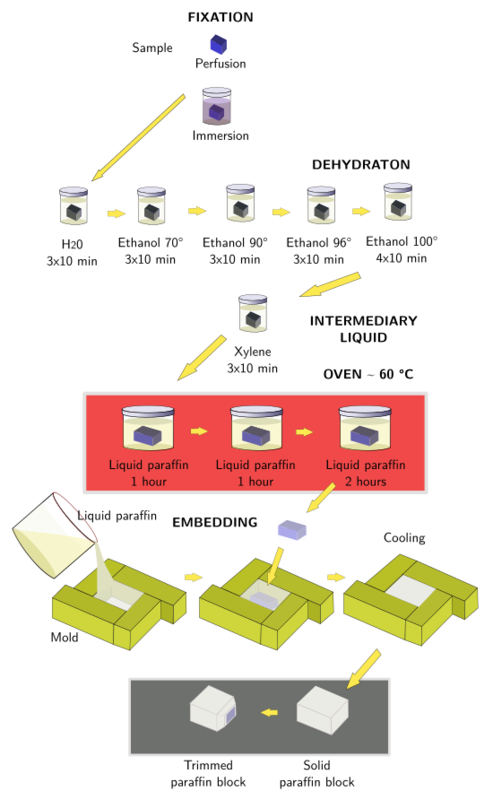 After the complete substitution of the intermediary liquid by paraffin, the sample is placed properly oriented in a mold with liquid paraffin Then the mold with the infiltrated sample and the paraffin surrounding the sample are leave at room temperature or on a cooled plate so that paraffin gets solid. Paraffin embedding procedure for fixed samples. Incubation times need to be adapted to particular sample size, fixative, intermediary liquid, and what the tissues is intended for. This sequence of steps is the most used in paraffin embedding.